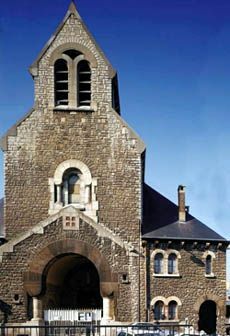 The Church of Sainte-Famille was inspired by Roman architecture. At the dawn of the twentieth century, Pré-Saint-Gervais counted for about fourteen thousand inhabitants. The church of Saint-Gervais-Saint-Protais could no longer accommodate the worshippers. The architect, Barbier, designed the plans of the new church to be erected in rue Paul-de-Kock and the first stone was blessed on 18th March 1912 by the canon Lefebvre, the archdeacon of Saint-Denis. Placed under the protection of Sainte-Famille, the building was built of granite stone. Its robust and sober appearance was inspired by Roman forms. The church is designed in the form of a large rectangle with rounded corners to the east. It is accessible from the facade by a broad semicircular porch, topped by a pediment built on round pillars, and under which a panel in relief shows the Sainte-Famille. Above it, in elevation, one can see a false vertical window while the pinnacle can be seen pierced with a twin bay. The nave has four bays lighted by stained glass windows designed by the glass master Barillet. The windows recall the main events of the life of Christ and the Virgin Mary. Finally, an organ, which is older than the church as it was built in 1910, overlooks the central nave of the building. The Church of Sainte-Famille has several sculptures in polychrome wood (which belonged possibly to the old chapel): a “Pieta” from the sixteenth century, a “Saint-Sébastien” and “Saint Anne and the Virgin” dating from the fifteen and sixteenth centuries. A painting (non-dated) represents the Virgin surrounded by Saint Anne, Saint Joseph and the child Jesus and Saint Jean-Baptiste. The baptismal front, contemporary to the church building, consists of a black marble bowl resting on a square foot stone. Hanging above, a copper cover inlaid with colored stones shows Saint Jean-Baptiste. A painting from the seventeenth century offered by the prefect of the Seine in 1837 hangs in the Church of the Sainte-Famille of Pré-Saint-Gervais. The painting reveals Christ on a cross attributed to a pupil of Philippe de Champaigne. Philippe de Champaigne (1602-1674) whose work was predominantly religious was an adept of Jansenist thought. His style was first bright and colorful but was tainted with austerity when he embraced the Jansenist cult. The Christ on the cross of Sainte-Famille has the expression of the characters painted by Philippe de Champaigne. In the background, the shadow of architecture could evoke the Abbey of Port Royal des Champs, the house of the Jansenists, in 1710, Louis XIV ordered its destruction.